Be the first to hear about their new releases and deals. Download the Booksprout app and search for Jacob Stanley today! 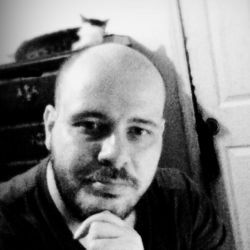 Jacob Stanley is a speculative fiction author from northeast Georgia. He developed an interest in horror and fantasy at an early age, reading everything from old pulp fiction works by Edgar Rice Burroughs and Robert E. Howard to horror epics by Stephen King and Robert McCammon. Eventually his interests branched out to include a huge number of writers from all the fantastic genres, including names as diverse as Clive Barker, Octavia Butler, C.S. Lewis, Robert Jordan, George R.R. Martin, Anne Rice, and Haruki Murakami. In his early 20s he became obsessed with cinema and got caught up in the dream of the new indie film boom of the 90s. His first actual attempts to write fiction were all screenplays that he wrote over the next 10 years or so. During that time he watched every movie he could find, from the classic works of masters like Alfred Hitchcock and John Ford, to the strange creations of David Lynch and Luis Buñuel. His fascination with extremes eventually made him a fan of numerous cult filmmakers, including Lucio Fulci, Roger Corman, and Russ Meyer. His books are an attempt to distill all these diverse influences from the worlds of literature and cinema into a rich soup of epic-horror-science-fantasy weirdness. In addition to writing, he's also been a guitarist since the age of twelve. In his spare time does a lot of reading, and enjoys hanging out with his family and pets.